Long years back I made this dress for my first daughter. A lot of work and care and effort went into this dress. What you can’t see is it has a crinoline and a little slip all attached underneath. The collar is cross-stitched and in itself took some 10-20 hours to complete. 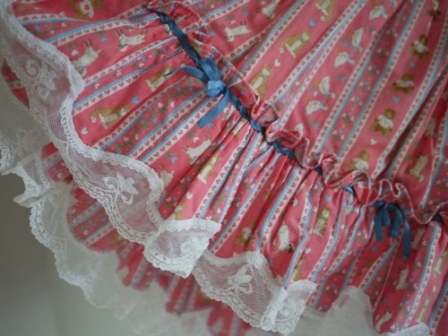 The ruffling is by hand as well as the ribbon detailing. 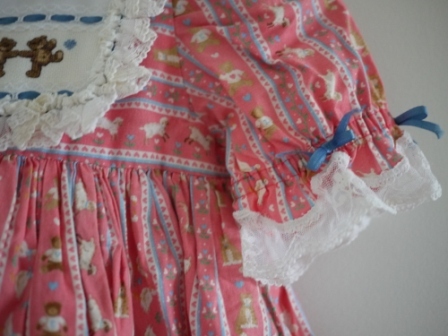 When I look at this dress (I saved it along with the others I made my daughter her first five years) I am reminded of how well I wanted life to go. I’m reminded of the hopes and dreams and all-good intentions of making life as pretty as this little dress. Long story short, the years turned out far worse than I had ever imagined anything could be. But I look back and I see it truly has been okay, in the biggest broadest sense of the term. The big picture of my life required those hard years. My heart had to be freed. My thinking had to be changed. My perspectives had to be transformed. I had to come to know the deep love of God regardless of circumstance and surroundings. I needed to find God in the midst of hunger, despair, loneliness, heartache, fear, and poverty. And I did indeed find God in all these things and ways and then some. My hearts rough edges were smoothed to a shiny gloss. The part of me that needed everything pretty-as-a-pin now knows that external beauty and peace means nothing if there is not beauty and peace in ones inner being. Fast-forward some two-dozen years and on the morning after my four-month old granddaughter Anna died in her sleep and I heard her say to me, “It’s okay Nana” I was ready to bank on that. There wasn’t a part of me that did not know that it was okay. Really. Truly. Has it all turned out like I thought? Barely a speck of it! Is it okay? You bet. So now, when I sit with my grandson Dorian on my lap, or think of my kids and those they will choose as spouses, the career decisions they are making, the educations gone after or not, I know that we don’t know how any of it will turn out. Will he know heartache and struggle? You bet. Yet will it be okay? Yes and amen. I can sit with my grandchildren and with my kids with peace in the midst of the unknown, with joy in the midst of sadness, for with a heart that does not need anything perfect or nice, this bright red thread of peace and joy runs through all the muck and the mire, the unexpected and the difficult. Because in the difficult our hearts are made expansive. In the unexpected we become resilient. In the unknown our faith is grown. And in sadness we find joy. Our life’s expanse has room for more people. Our resilience makes way for new strengths. Our faith spurs on new life. And joy, well joy is never taken away. Once we have it, once we know it, everything changes. We think we must have the good and the worthy to invest in the Kingdom of God. Nothing is farther from the truth. We must first start by offering our losses and our failures, our incomprehensible realities. Only then do we truly get God as good and trustworthy and honoring. And only then can we invest out and about to those we meet regardless of their circumstances. Quite frankly, until we are okay with it not being okay, we will never meet others in the midst of their pain. Until we are okay with loss we can never sit in companionship alongside others loss. Until we have come face to face with our own poverty of soul we will never truly be able to fellowship in the poorest places on earth. And until we know it doesn’t have to be perfect we have little to offer but grinding expectations and dishonest reckonings. Bottom line, none of it is okay, but that is okay. For we, we are simply okay. This entry was posted in Cyndy @ Capturing Courage and tagged faith, joy, peace. Bookmark the permalink.